Are you struggling with extreme burnout? Or burnout at any level? I can understand. I’ve struggled with burnout this year, off and on, more than at any other time. The pressures of family (including having a newborn baby) plus online ministry plus in-person ministry here in my community are high. Sleep is lacking. Things have just felt pretty tough lately. When I noticed myself feeling burned out recently, I began praying about it. I know burnout is not from the Lord. In Isaiah 43:1-2, He actually promises that the pressures and difficulties around us will not touch us! ‘Fear not, for I have redeemed you; I have called you by your name; you are Mine. When you pass through the waters, I will be with you; and through the rivers, they shall not overflow you. When you walk through the fire, you shall not be burned, nor shall the flame scorch you'” (Isaiah 43:1-2). No matter how hard things are, Papa promises that the hard things won’t hurt us. And when our experience is different than Papa God’s promise, we have the opportunity to examine ourselves and figure out why. It’s not God’s Word that’s lacking when we don’t experience what God promises. It is always us. Even if we don’t mean to, we may be missing a revelation, an understanding, a pre-requisite, or a condition to God’s promise. That makes things easy, because if we aren’t experiencing what God promises, all we have to do is ask Him to show us what we’re missing! If you’re feeling burned out, praying about the situation is key. When we pray through each aspect of burnout, Father will show us what is wrong. He makes things easy to fix! It’s like what happens if you put a stick through the spokes of a bicycle wheel. If you do that, the wheel will get hung up and it will no longer turn. But if you take the stick out, the wheel will turn just fine. 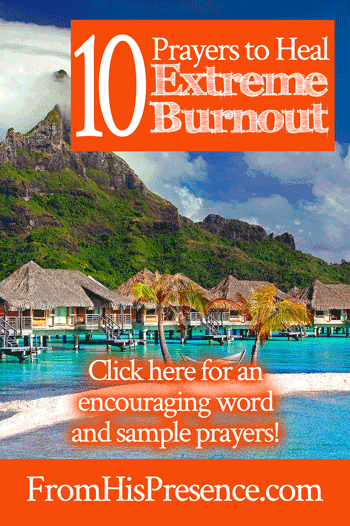 So I’m going to write 10 prayers for healing of extreme burnout over the next several blog posts. The prayers are progressive; each prayer builds on the ones before it. These are the prayers I prayed when I began feeling burned out, and Father is healing me more each day. As you pray through these prayers, I believe He will heal you too. 1. Show me the source of this burnout. Therefore take up the whole armor of God, that you may be able to withstand in the evil day, and having done all, to stand” (Ephesians 6:12-13). You may be burned out because you’re not getting enough sleep. That’s certainly common, and I know it has played into my situation for sure. However, you may also be experiencing spiritual warfare. Spiritual warfare is real, beloveds. Remember that the thief DOES NOT COME except to steal, kill, and destroy (John 10:10). When the enemy comes against you, he wants to kill you and rob you of your peace, joy, and power. BUT, Jesus came that you may have life, and have it more abundantly. You are always the victor in Jesus. You are more than a conqueror through Christ who loves you! But in order to conquer something, you have to notice that you’re in a war so you can fight properly. That’s why the first step to healing from extreme burnout is to simply ask the Lord to begin diagnosing the situation for you. What is the source of this burnout? Are you unhealthy or malnourished? Are you sad about something, and that sadness is wearing you down? Are you fighting the enemy because of some big breakthrough that’s coming on the horizon? Asking the Lord these questions will help you tremendously in your healing process. “Father God, in Jesus’ name, thank You for loving me, caring for me, and hearing me pray. Thank You for taking care of me. You have never failed me before, and I know You will help me now. Father, Your Word says that my help comes from the Lord. So I’m lifting my eyes to You right now, and I ask for Your help. Father, please heal me from this burnout I’ve been feeling. Show me first and foremost where it’s coming from. Father, am I dealing with a physical issue here? Is it a spiritual issue? Is it a combination of things? Only You reveal hearts, Lord, so please search me and show me the root of the matter. Teach me how to combat it and how to apply Your Word to it. Fill me with Your Spirit, and give me wisdom and direction. 2. Show me why I’m trying to carry so much. We tend to think we are super-human … and we are, for the same Spirit who raised Jesus from the dead lives in us. One of my favorite preachers, Bill Johnson, says, “When Holy Spirit came to live in you, you lost the ability to claim you are only human.” 🙂 I love that, don’t you? We are to cast our care upon Jesus in order to live a peaceful and happy life. So why don’t we? There has to be a reason; and, if we’re to heal, learn, and grow, it will help us to find out what the reason is. Is it distrust of God? Is it anger or bitterness against God? Do we feel like He let us down in some way in the past, so we can’t trust Him now? Is it hope deferred–in which we’ve been praying for something so long (without seeing it) that we feel like it will never happen? It can be hard to wait on God’s timing. However, giving up on your hope will destroy you. Even though God waits a long time sometimes, He will always answer IF we do not give up. Burnout is often simply the result of giving up or getting discouraged. But beloved, we have to hang in there and believe God! We can’t do it in the power of our own flesh, but we CAN hang in there by casting our burdens upon the Lord each day. We are to be anxious for nothing; but in everything, with prayer and supplication, with thanksgiving, we must make our requests known to the Lord. When we do, His peace that passes all understanding will guard our hearts and minds in Christ Jesus (Philippians 4:6-7). “Father God, in Jesus’ name, I thank You that Your eye is on the sparrow–so I know for sure You are watching me too. Father, I’ve been carrying too much. It has worn me out and worn me down. I can’t do it anymore. Father, I’m coming to You for help. Something has been keeping me from laying my cares at Your feet and resting in You. Would you please show me what it is, so I can let go of everything I’ve been carrying and find true rest? 3. Father, help me to lay everything down that I need to lay down. It takes humility and faith to drop things at the feet of Jesus. If you haven’t been doing that, it’s perfectly okay to ask Father to change your heart so that laying things at His feet is easy, not hard. “Father God, in Jesus’ name, please forgive me for trying to carry these burdens. Please forgive me for _____ (insert whatever He showed you in prayer #2 here). Father, Your Word says that You will take away my stony heart and give me a new heart of flesh. Your Word says You’ll take away my old spirit and give me a new spirit. So Father, please do that right now. Please take away my old heart and give me a new heart–Your heart, Father. Please take away my old spirit and give me a new spirit–Your Spirit, Father. Father, please make me humble. Fill me with Your Spirit. Please forgive me for offending You by refusing to rest in You. Please forgive me for every way I have refused to trust You. Please forgive me for carrying my own burdens, when You said I should cast my cares upon You, and You will sustain me. Those are the first three prayers for healing extreme burnout. Did this message speak to your heart? Did you pray these prayers with me? Please leave a comment below if so, and check back in the next blog post for the next several prayers! god bless you,really it was my cry,why am carry so haevy for years in and out. Today my doctor told me that I am battling depression. I’m sure it’s due to burnout. Literally everything on the list as a possible reason for burnout is happening to me. I am so grateful for this devotion and the prayers. They’ve already begun to bring me clarity and prepare me for how to pray through this trial. THANK YOU!! THANK YOU! THANK YOU!! As always right on time!!! Thank you FATHER for moving through people and Thank you Jamie for understanding and using your gifts to deliver and transform. GOD BLESS YOU!! Yes Lord I lay my burdens at your feet. Forgive me for not trusting you in these difficult tmes. I will cast my cares upon you Lord believing you will sustain me. Thank you for these prayers Jaime. My sister has suffered depression for over twenty years over the loss of our Dad. She and I have been best friends since little girls .She has not grieved properly and now is so unreasonable and has turned her family against me. I have for the past six years, prayed every prayer and taken communions, genuinely loved her where she is at…she just keeps playing the blame game…so much anger! This adjustment in our relationship has caused me and my family so much heartache. My sis and her family don’t attend church cause of all the hurts received there. Her husbands family is mean and cold. It is the saddest. Plus we have a daughter who is an alcolic and there is a granddaughter involved. And a daughter who has meneries disease, vertigo where she cannot drive sometimes. It all has just been a lot. I am 67 years old…45 years as intercessor leader, prayer minister…Jesus and .family are the most important! 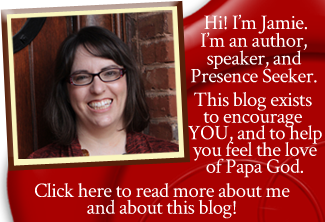 Your prayers are very affirming…I so appreciate your teachings and sharing!!! Blessings and prayer of thanksgiving to our Awesome God for you? Thank you for always igniting hope when we (christians) are in the verge of giving up.Glory to God. Thank you for letting God use you, you have given me, the ability to face the fact that I failed in trusting God, I made some wrong choices and it placed me back in a situation, I never thought I would be in (third time), however, my choices, have placed me back in a co-dependency marriage (third marriage), I have an 11-month-old baby (four girls total) who’s father who continues to go back and play with his addiction, he hasn’t fully surrendered to it, however, he steals from me and he lies to me about it, he was called to preach and it breaks my heart because when I meet him, I didn’t stop at the red flags, I wanted to believe he would follow through so here I am 2 years married 3 years in the relationship. I just want to run, disappear I feel hopeless, scared, stupid, and empty. I beat myself up for making the wrong choice a third time!!! Please pray for my direction, for my mind to be clear as to what to do… You see my husband always says this is it the last time!!! yet so many failed times, I no longer believe him. Please pray for me I need help!!! Hey there, I am proud of you for admitting what you have done. I pray you would pour out your heart to God in prayer about all these things, for He already knows and is ready and willing to forgive you when you confess your sins. He’ll give you a new heart and a new spirit, if you ask Him too, as well! He can make all things new in your life. Big hugs to you! Thank you for reading!